Well now my version of the exteriot Since I finally have the look of my exterior I could add some more lights to my landscape as I usually do the lights last. I placed some walls in the basement and used them to raise some lights and hanging flower baskets to the columns. On the roof I placed a satellite dish and made a chimney by combining one of the game chimneys with half walls. I placed the door on the short side of the porch and not at the obvious front. To avoid having a bare roof on this side I added another roof with a window. 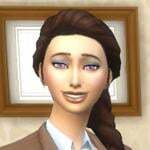 I decided on a more open latice and added some scrubs to it for the Sims to have some shade. I MOOed two couches together to get a corner. Sadly the corne obviously isn't useable. 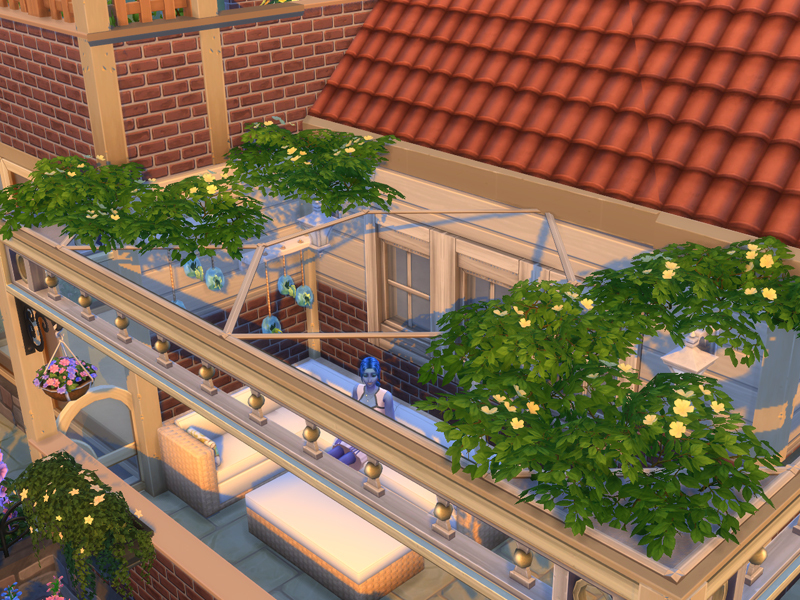 For the roof patio I used a glass dancefloor to create a skylight for the room below. 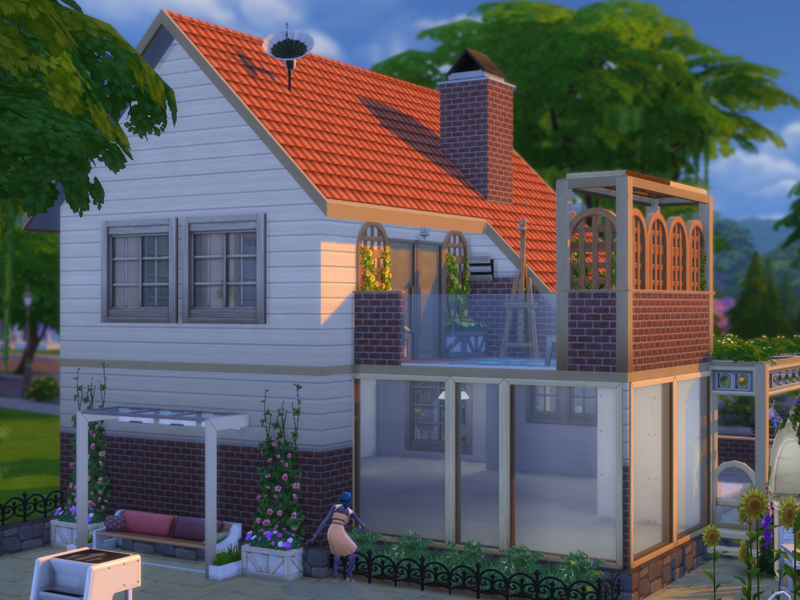 In order to do something different, I combined the glass fence with halfwalls. The halfwall was needed to avoid a gap between fencing and roof. And with the glass it creates a more open feeling to the patio. Gallery link is here. Any feedback would be very much appreciated. 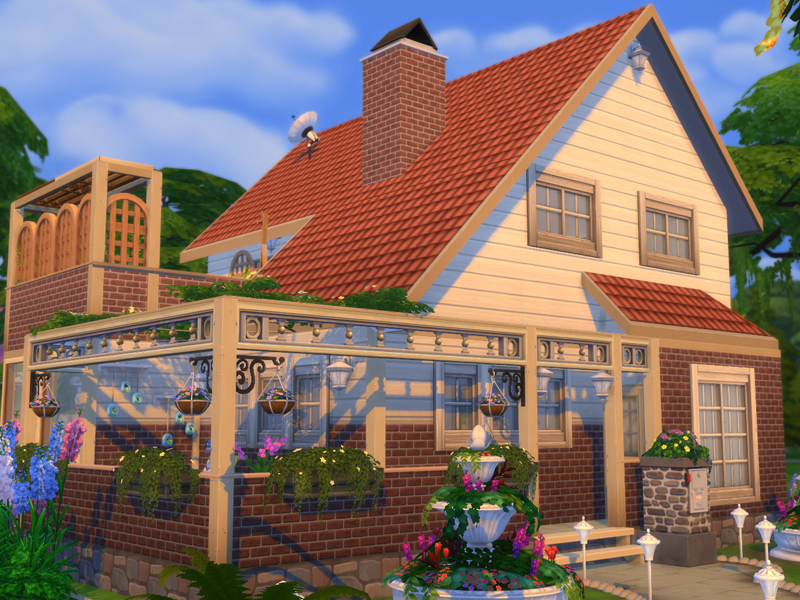 Your build looks so cute and cosy @crysk I love the brick with the siding i dont use it enough! 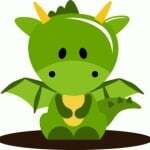 @Amiejaidenalbie_1988 I can't understand why people reupload other people's stuff. Where is the fun in that? @lisa17ann I love your house:) the blue and the white and all the plants are so gorgeous. Your build looks very nice! @crysk The sattelite dish is a great touch on the roofing. The windowed dormer roofing on the other part of the roof looks nice. The lattice roofing on the ground floor patio looks very nice, and the greenery on top of it adds to the nice look of it. It looks nice the way that there is a corner of sofa seat it. The spandrels look great how they are used for the patio area. The hanging baskets are a nice touch there. Very nice rooftop patio! The giass flooring looks very nice! The sofa seat sitting nook there is very nice! 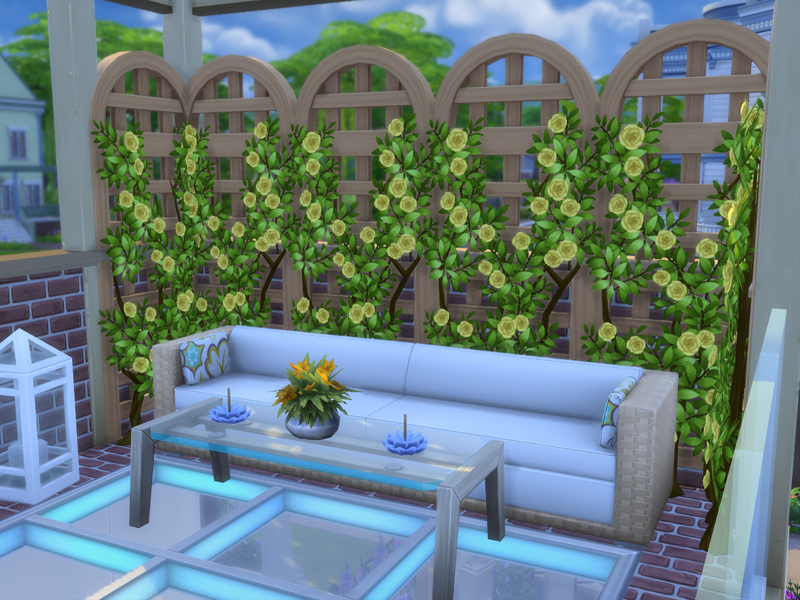 The floral lattices trellis walls beside the seating looks very pretty! 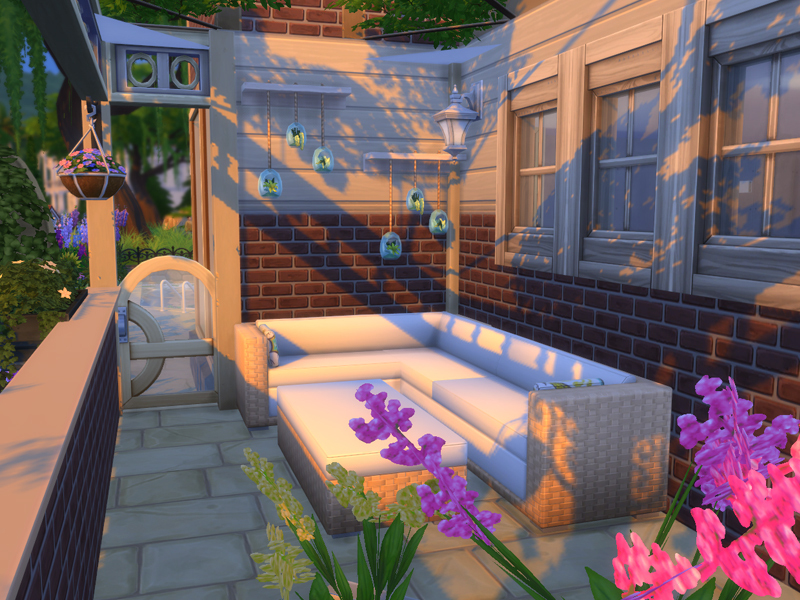 Nice art nook on the patio for sims to enjoy painting in the outdoors air. The floral trellis and flower boxes look nice together. Ok here is my exterior, 2 patios and roofing. 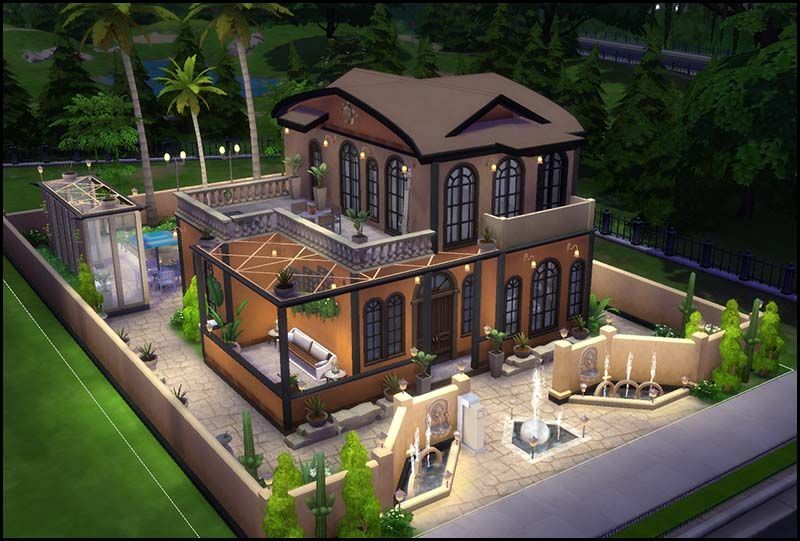 Though I am not 100% happy with this it may get changed slightly before I upload the final house I have changed it soooo many times already just ask @lisa17ann shes had to listen to me whinge about it haha. 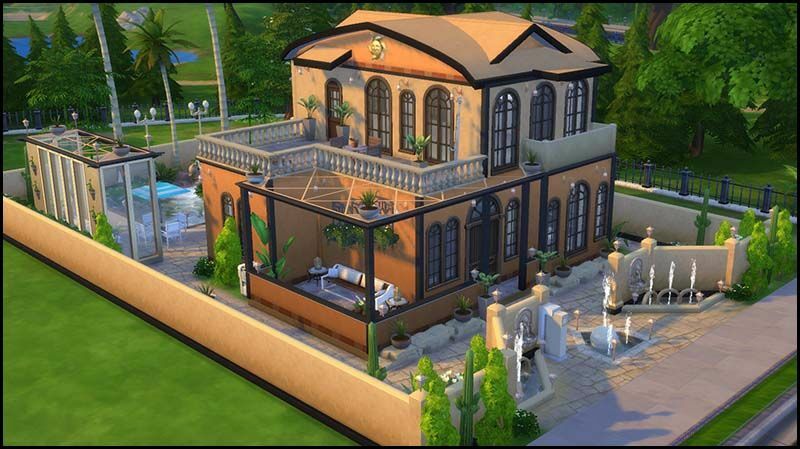 So when I started the exterior it was leaning towards Mediterranean which Ive never done before but in the end I softened the look a bit more because I wanted it to suit the oasis feel landscaping. Im not sure I have completely achieved this yet but will see once its finished. Ive used two different wall coverings for the exterior and matched the sandy style to the fence, I also gave the dark brown trims to break up the light colors and matched that to the foundation trim on the exterior fencing around the lot. I added greenery in my exterior walls to match my oasis theme. The roofing has 4 pieces and 3 different types of windows. For the patio roofing I matched it to the little bbq patio in the back yard and also added some plant pots on the top for more decoration, Its nice to leave some of the ceiling in pieces for you to decorate instead of making them all lattice gives them a bit more of a unique look. The patio fencing I made myself to match the fencing near the back door and put some relaxing hobbies such as yoga and chess on the patio. And to top it off the lighting for night view, though I am unsure if I like the exterior lights I used i was having trouble finding something that suited, I will probably play around with them a bit before I upload. Any questions feel free to ask and if anyone wants to critique my practice challenges let me know and I will upload because I am far from perfect and I know I make mistakes to. Your challenge 2 part of the challenge look very nice! 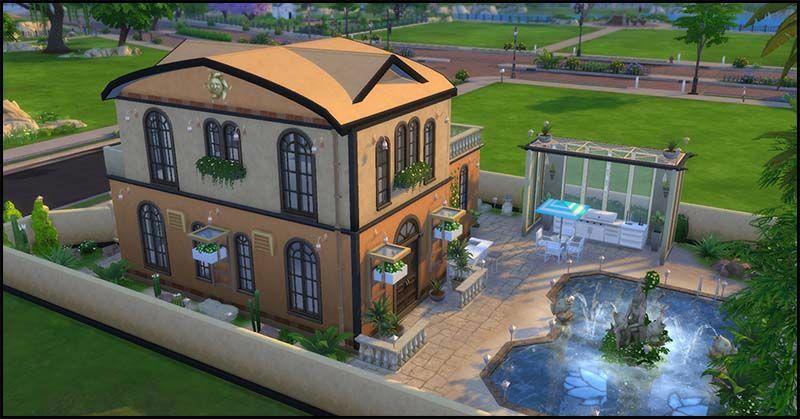 @Cbear13 The Mediteranean theme of the build looks very nice. Very nice roofing! The sun decor is a nice touch on the roof. The textures of the exterior look nice and suit well the theme of the build. The dome type windows look nice in the build and look very great the way that they are placed! They give a very nice look to the home. The planter boxes are nice touches of green on the windows. The lattice over the patio looks very nice! The plants look very nice placed on the corners of the lattice! Nice sofa seat seating area. The candles are pretty on the side tables either sides of the sofa. Very nice rooftop patio. Sims will enjoy looking out at the views whilst painting on the easel. 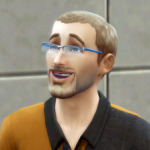 It is a nice place for sims to enjoy quietly doing yoga on the mats. 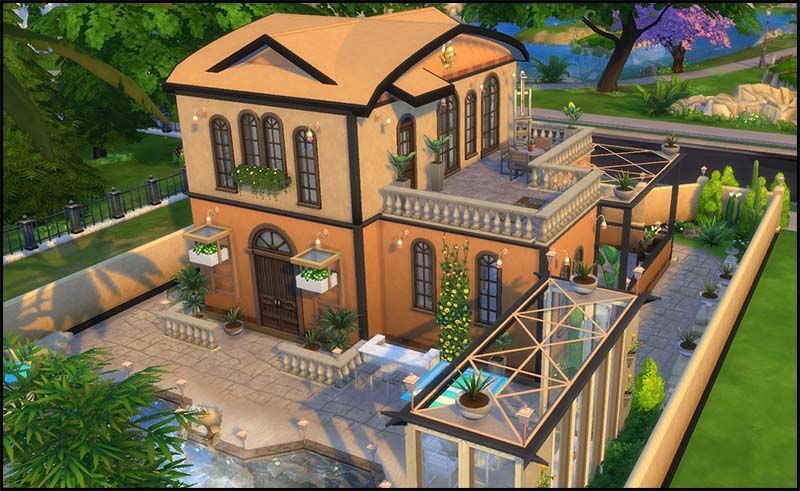 Looks very nice @Cbear13 nice that you gave Mediterranean build a try and I have one also but a bit different from last time so should be putting mine up soon. 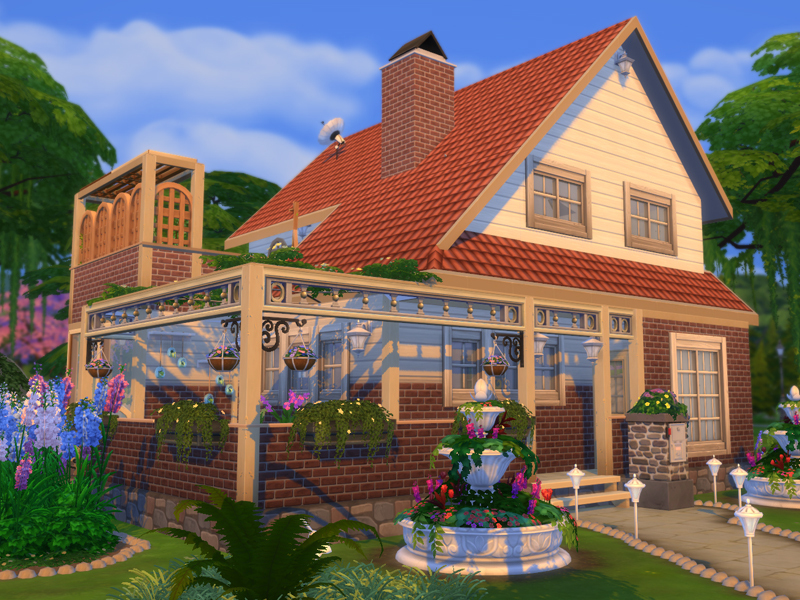 I have change a few things a bit as I was not happy with it and also had trouble with the roof and patio with the Lattice that's on the house which I gave up after 2 hours on it. it looks wonderful @chips if you get stuck on something like the roof patio and lattice feel free to ask for help, what were you trying to do? The build looks very nice @chips46 The greenery looks very nice on the lattice roofing! Very nice rooftop patio! 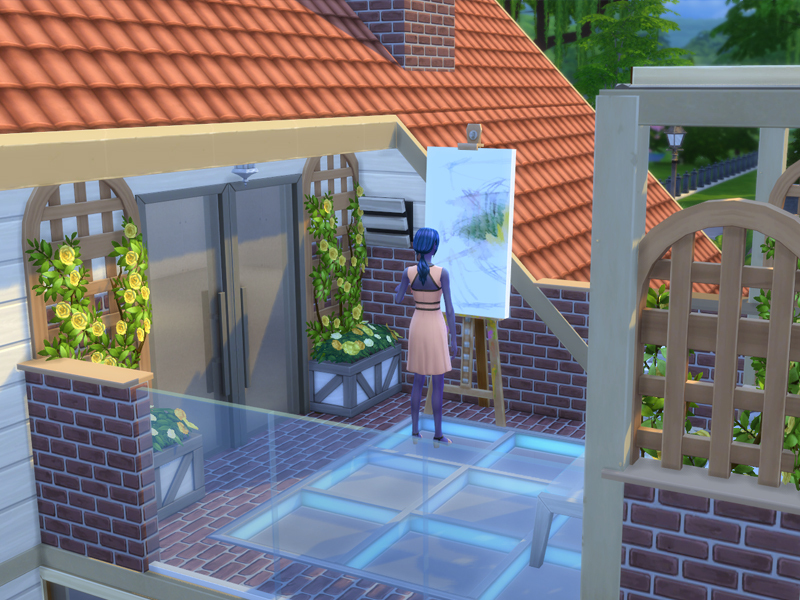 Sims will enjoy painting on the easel there whilst looking out at the views. The art decor item looks great there. The patterned flooring looks very nice. The plants and pedestals look nice placed either sides of the rooftop patio door. 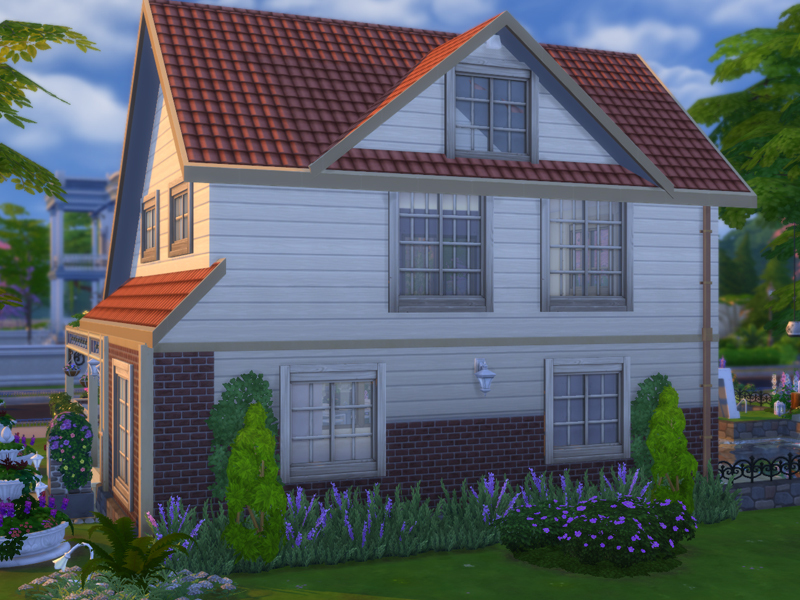 The exterior wall textures of the home look nice. The planter box windows and the greenery on the wall add to the nice look of the build. Sims will enjoy playing chess at the chess table on the ground floor patio. You all have been doing such amazing work! I've learned a lot just by following this thread. Can't wait to see what you come up with on the inside! This is the roof that I had in the first place which was ok at first until I check on the patio which part of the roof was showing a bit which I know it did not look right and no matter what I do I could not work around it so I had to leave it. 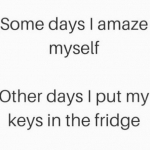 and I'll try and ask next time when I'm stuck with something. 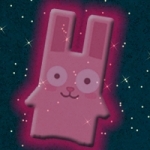 Thanks, thanks, thanks for the feedback @Cbear13 Wow I did not know that ctrl F work that way with those designs, I use it only with plain tiles I really need to use moo with my statue, I really do not like that cheat, it is hard to avoid accidents with it. Your build looks very nice! @steskens Very nice rooftop patio! The lattice roofing that you have used there and in the other areas of the bulld looks nice and the red flowers on the tops add a nice look to the lattice. The bar counter and art nook areas on the patio look very nice! 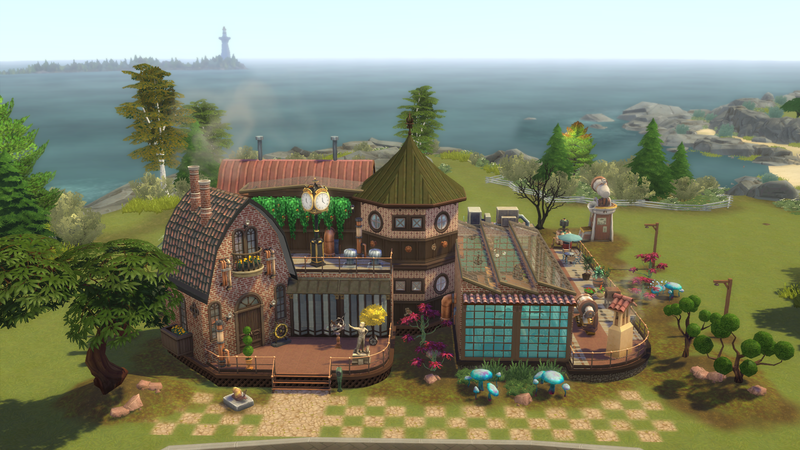 Sims will enjoy sitting on the stools having a drink from the bar and a chat outdoors. The bottles and cups are great touches on the counter and the fruit bowl looks nice there placed on the fruit crate.The sims will enjoy painting on the easel whilst looking at the views of the outdooors. The patio flooring texture gives a nice look to the area. The texture of the exterior walls of the home looks nice. The glass tiles skylight roofing is great! The flower boxes are a nice touch on the exterior wall. Very nice lattice covered side patio sitting nook. Sims will enjoy resting there on the sofa in the sunshine. I just solve the problem on the roof exterior trim was a bit too large so I put the smaller one on and It's not going through the patio fence and also the Lattice I change the pattern and everything looks good so I don't think I need that feedback anyway thanks If you have already look at It. 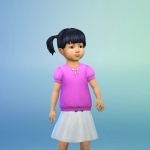 Ok firstly will comment on the changes you made to part 1 by the way it looks sooooo much better now well done. I love the blocks of hedging out the front it really gives it a different look, I love the new pathing and the decorative fountain in the middle. One thing I would do is on the left side of the house next to the path its just plain grass I would copy your garden beds from the right side. I love the table decoration and the added trees on the back patio and i love the pool decoration. I agree with @crysk about either continuing the fountain down the right side of the house or but something there as it looks quite bare up against the house, so either needs that done of some wall decoration. Here is another idea of combining the two. 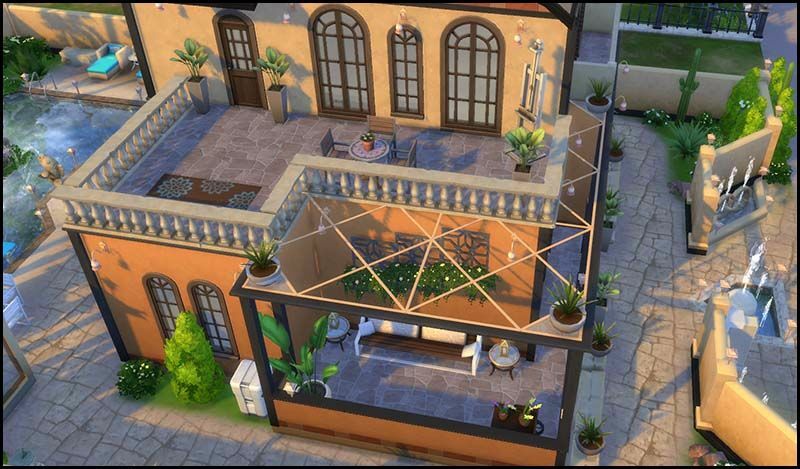 The lattice roofing looks great I love that you used the thicker fencing, you can decorate it up some more if you like with plants but I think it looks fine considering you covered part of it with roofing. 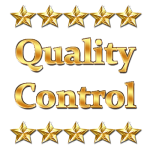 Great job on your patios they look wonderful, lots of decoration yet still looking clean cut for modern style. 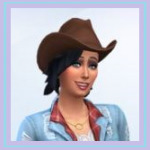 @lisa17ann I love what you have done for part 2 especially the roofing covering the top patio and gorgeous lattice roofing.